Blue Lake’s Dell’Arte International has been called “The artistic gem of Humboldt County,” bringing original entertainment to local, national and international audiences for 40 years. As one of a handful of rural, professional ensemble theatres in the USA, we are internationally recognized for our unique contribution to American theatre and DAI is proud to call Humboldt home! 2015 marked the 25th anniversary of DAI’s annual summer Mad River Festival, which began as a festival of local, community-made plays. Over time the MRF grew to include international companies like Brazil’s Lume Teatro, wildly popular favorites like Los Payasos Mendigos and the San Francisco Mime Troupe, music, puppetry, and the Dell’Arte Company’s signature ‘theatre of place’ original productions. 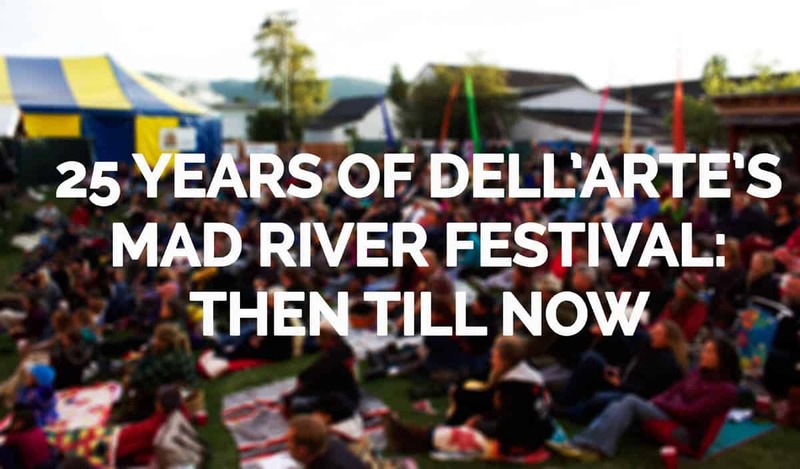 The Mad River Festival was hatched as the brainchild of Dell’Arte’s co-founder Jane Hill, who in 1989 staged Barry Manilow’s The Drunkard, based on the world-famous melodrama by W.H.S. Smith. This rollicking musical version was performed on our new outdoor stage, constructed by the actors and technicians of the Dell’Arte Company under the direction of actor Donald Forrest. (Luckily he was a concrete foundation expert.) We all poured piers–I remember we used big ice cream tubs for the molds– nailed planks, and then re-graded the backyard with recycled concrete to give our audience an optimal view of the stage. In 1991 Jane figured that if one melodrama was popular, maybe more would be merrier. So she proposed a festival of original melodramas based on regional history, to be created by local communities with assistance from Dell’Arte artists via acting and writing workshops. Our neighbors to the east in Willow Creek developed The Poison Oak Club, about the failed attempts of the FBI to infiltrate a supposed local ‘communist cell.’ The southern Humboldt town of Redway contributed a melodrama by local author/historian Ray Raphael, about California’s founder: Floundering Father—and Mother Too! An Evening with John and Jessie Fremont. It was acted by Redway’s Pure Schmint Players, directed by Jane Hill. “A cause for celebration … a wickedly clever script” said the Eureka Times-Standard. In 1992 the Dell’Arte Company conceived Korbel, its first Humboldt soap opera, about a fictional small town in redwood country. The decline of the timber industry brought hard times to the town and to the Dugans of Korbel— brothers Tommy and Terry (Michael Fields and Donald Forrest), and their mother, Dorothy (me). The family’s downturns echoed the region’s economic decline–from jobs lost through mill closings to their inability to pay the electric bill—familiar enough to local audiences that they not only laughed at the comic Dugans but totally empathized with their plight. At the 1994 MRF, Korbel: The Funeral was an instant hit. The iconic Dugans lived on through another five episodes over the next 20 years—The Wedding (1995), The Birth (1996), and Shotgun Wedding, (2000) an updated Moliere adaptation that I set in Korbel, with Tommy Dugan stuck in a nest of local politicians and a family of rural con-artists. You didn’t hear from the Dugans again until 2008, with Korbel: The Accident and finally, 2014’s Korbel V: The Secret by Lauren Wilson. The Korbel series typifies our pioneering approach to ‘Theatre of Place’: plays about and for the community where you live. We’ve been creating such work since our first touring success, Intrigue At Ah-Pah. The Festival became the primary spot for the Company to develop its original local plays, for example, Wild Card (2002) and Wild Card 1.5 (2003) by Producing Artistic Director Michael Fields, imagining the potential impacts of the casino then under construction on the Blue Lake Rancheria. Or Blue Lake: The Opera, a genuine opera with libretto by Lauren Wilson and music by Tim Gray. Early festival guest artists included the Karuk Storytellers, Jeff DeMark, and dozens of local bands, which led to a partnership with the Humboldt Folklife Festival that continues to this day. The MRF has evolved to become a place where we can hold up a mirror to our own community and our own lives here, as well as create plays with bigger casts and a more local bent than our touring work. It was the Dell’Arte Company’s international touring work that brought our attention to some sister ensembles we thought might delight Humboldt audiences. In 2000 the MRF presented the American debut of Brazil’s Lume Teatro, with both a lively street show and a virtuoso clown show, Cravo, Liria y Rosa (Carnations, Lilies & Roses). Russian circus stars and theatre ensembles from Hungary, Sweden, Denmark, Italy, Canada, and Australia have also been presented at the MRF, as well as many repeat performances by those ‘Spaniards in Spandex,’ the hilarious Los Payasos Mendigos. Members of this comic acro quartet, all of them Americans, began as local favorites (three were graduates of Dell’Arte School) and parlayed their popularity into two international tours. For the 1993 MRF they pulled off an ambitious comic version of Don Quixote de la Mancha, and in subsequent years continued to entertain us with fiery hoops, an onstage swimming pool, bullwhips and stunt babies. Never afraid of danger, they nearly lost ‘Guapo, The Handsome One’ when ‘El Excremente’ whacked his machete too forcefully into a watermelon on Guapo’s head. Ouch! Mad River Festival audiences do love comedy and it has never been in short supply. Through 25 years the popularity of clown and vaudeville has produced several zany revues, including appearances by the Flying Karamazov Brothers, plus wild treatments of great classics like Goldoni’s The Coffee House (01), Moliere’s Tartuffe (’07), Peer Gynt (’06) and Shakespeare’s The Comedy of Errors in 2013. In 2008 we began partnering with the Danish Institute for Popular Theatre in presenting The Prize of Hope, an international award originated by them in 1989, “given to a person or theatre who has worked for human hope—in a daring, loving, vulgar, serious, poetic way, with sparkling energy….” Film star Tim Robbins and The Actors’ Gang received the award on our MRF stage in 2008. We’ve since presented during its California years to actors Geoff and Dan Hoyle, to our Petrolia neighbors Human Nature Theatre, and in 2014 to Clowns Without Borders. A year ago I traveled to Denmark to take part in presenting the prize to Ariane Mnouchkine and Le Theatre du Soleil, one of the world great companies celebrating its 50th year. The initial seasons of the MRF comprised mainly outdoor work, and audiences loved the open space of Rooney Amphitheatre, spreading their blankets or camp chairs on the ground and enjoying picnics or Dell’Arte’s food concession and full bar. The original plan by architects Bill and Colette Van Fleet called for Greek theatre-style bench seating. But when surveyed, audiences overwhelmingly said “keep the grass seating!” so we did. With the addition of a dressing room wing to our Odd Fellows Hall in 1995, we gained additional playing space on the decks and porches constructed above our stage. You are likely to see actors running around a second level, or singing to you from the roof. You never know where they’ll make an entrance—possibly rappelling down the side of the building, or diving off the second floor balcony. Last year the addition of a ‘Big Top’ or gospel tent gave us yet another space for shows, workshops, and summer atmosphere. In partnership with the City of Blue Lake’s Annie & Mary Day celebration from ’97 – ‘07, the MRF staged many “Blue Lake Pageants” that included a parade traveling from Perigot Park to the street in front of the Odd Fellows building, where audiences were treated to a spectacle culminating in the raising of a 30-foot high puppet of ‘the spirit of the lake.’ Each year our ‘Mobile Mask Unit’ made over 500 masks to distribute to the public as they joined those extravagant parades, which included a samba band, stilt walkers, and even Bigfoot. Nearly two decades ago, indoor shows in the Carlo Theatre also became part of the MRF, which allowed for dramatic, more intimate productions as well as the annual sold out Red Light in Blue Lake late-night adult cabaret, featuring local musicians, Dell’Arte Company actors, alumni, and sometimes local burlesque troupes. Some of our most exciting MRF premieres, like Giulio Cesare Perrone’s Paradise Lost, have been presented in the Carlo as well as many solo shows from artists like Sara Felder, Jeff Raz, Mooky Cornish, Colin Gee, Dan Hoyle, Jim Donlon, and Joe Dieffenbacher. DAI continues to support and present the work of our talented alumni from around the world, aided by a fellowship from the family of late alumna Nancy Jacobs Lafrenz. This year’s 25th anniversary festival is a true celebration of the festival’s commitment to bring one-of-a-kind performances from ‘around the world and down the block’ to sunny (very often) Blue Lake. It’s not how we began the Festival, but that’s what we’ve grown into! The 2015 MRF offers a multitude of performances including original Dell’Arte Company work, a week of international theatre, a family big-top series, an experimental theatrical laboratory, a saucy late night cabaret, a week of local music with the Humboldt Folklife festival and more. “Around the World Week: International Performances” welcomes talent from Japan to San Francisco in a 7-day performance extravaganza featuring family shows, musical shows, readings and tent shows. 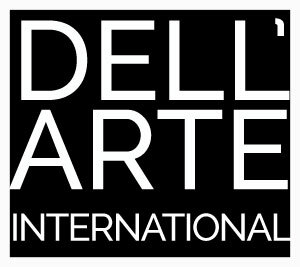 In addition to marking the Mad River Festival’s 25th year, 2015 also marks the 40th anniversary of Dell’Arte International in Blue Lake. July 5 – 11 is homecoming week for DAI alumni, former staff and faculty, with a grand reunion celebration with performance, workshops and reflections back on the years between July 6 – 11. Check www.dellarte.com for a full roster of events, including the Red Light adult cabaret, family shows, and the week of music from the Humboldt Folklife Festival. THANKS TO OUR COMMUNITY, OUR SUPPORTERS AND OUR AUDIENCES! The Mad River Festival would never have been possible without the Blue Lake community, plus generous support from local businesses and media like Pierson Building Center and Stephany Joy of ReMax Realty, but most of all from you, our audiences. For 25 years we’ve enjoyed playing for you!